Place shallot, vinegar, mustard, sugar, strained blueberries, cilantro, salt and pepper in a large bowl. Toss to combine and set aside. Place cumbers in a bowl, add salt and toss. Set aside for 15 minutes. Drain and rinse cucumbers and pat dry. Add cucumber slices to bowl with Dressing. Toss to combine and marinate for 15 minutes or set aside until serving. Soak bread in a large bowl with reserved blueberry juice for approximately 10 minutes. Add water if necessary. Add minced meat or ground meat, egg, shallots, mustard, salt and pepper. Knead to combine. Wet hands and form small meatballs. Place on a tray or plate. Heat clarified butter in a saute pan over medium-high heat. Add meatballs, saute until cooked and caramelized, approximately 10 minutes. Place Cucumber Salad on a platter or individual plates. 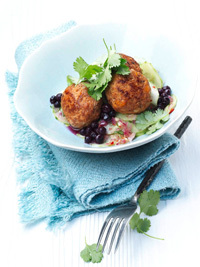 Add Mini-Meatballs, garnish with cilantro and serve. Preparation Time: approx. 1 hour.